You are here: Home / Content / What makes a successful sales presentation? Do you give sales presentations? Perhaps you travel to prospective clients‘ offices and pitch a product or service. You may give webinars online to sell your wares. Another scenario: You invite people to your office and give them a presentation on what you offer. Many products and services are sold via presentations. Your success depends on the effectiveness of your presentation. Sure, you also need to set up the presentation in advance and follow up afterwards, but the presentation is the pitch. You can give the most stunning presentation ever, but if you don’t have a solution to a problem of the potential customer, you probably won’t make the sale. If you do, you’ve cheated him/her into thinking you do, and that isn’t ethical. On the other hand, you may have a solution, but not explain it clearly and this is where presentation preparation comes in. As you prepare what you will say, check to make sure that your content is clear and organized. Explicitly state the problem, based on prior discussions or on answers to your questions during the presentation. Then show how your product or service will solve the problem. When you explain your solution, you need to connect everything you say to their problem and back it up with both hard and soft data. Hard data is facts and figures. Soft data is testimonials, your company’s experience, names of well-known customers, and conveying how your solution will make them feel. Slides that you create need to be crystal clear. Because people can’t read and listen at the same time, if you use slides with lots of text, they’ll read them and won’t hear much of what you’re saying—that isn’t being clear. Your diagrams and charts need to be easy to understand and make your point without irrelevant content. If you need to provide highly detailed data such as a spreadsheet, use a handout so people can follow along the rows with their finger. Don’t provide data that isn’t necessary during the presentation. Leave it as a handout afterward, if people want to study it before making a decision. All text should be legible and keep animation to a minimum, unless it shows a process. All visuals should be high-quality. Avoid distracting backgrounds. Use the Tell ‘n’ Show Method, which puts one point on a slide and backs up that point with a photo, diagram, or chart. Watch my video about how to design slides with one point on a slide on YouTube. 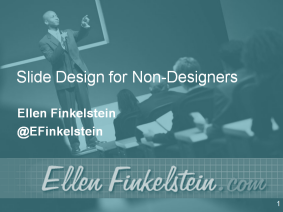 For more detailed instructions, check out my webinar, Slide Design for Non-Designers. When you speak, think of your presentation as a conversation, especially in a small group. Interact with your audience, meet their eyes, ask and answer questions, be friendly and natural. Your potential customer wants to buy from a person not a presenter. One more thing I would add to this would be “the close”. You can have the best sales pitch out there but if you don’t properly close the deal then it’s all for nothing. Many people lose their confidence here when all you have to do is ask.